All servers will be wearing a “uniform” designed for comfort, ease of movement, modesty, and beauty. The outfit consists of a sari wrapped in a modified “fishtail sari” style, a backless choli, and jewelry. *Please note- you are not required to have this outfit to serve feast!! 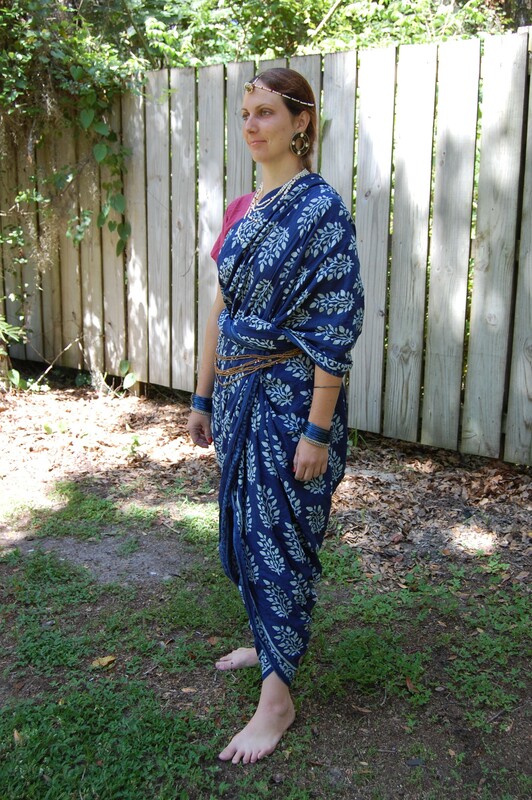 Period-looking saris are relatively easy to find. The easiest and least expensive option is block-printed, tie-dyed or resist-dyed cotton. Kalamkari cotton and simple silk saris are slightly more expensive. Look for individual designs elements scattered evenly over the body of the sari, no beadwork or mirrors. Any and all colors are appropriate, but try for strong colors as opposed to pastels, with minimal gold or silver thread “zari” borders. Modern zari is usually woven into the borders as a floating weft. It snags and frays easily, making the sari “blingy” but delicate. In a pinch, any 7-yard long, 36″ to 45″ inch wide piece of thin, smooth cotton fabric will work! I suggest voile-weight cotton for drape without bulkiness. The choli is a fitted garment, similar to a bra with sleeves. The style of choli worn at this time and place has sleeves ending above the elbow, a lower edge ending a rib lower than the bottom of a bra, and a scoop neck that comes up just below the collarbones. Since the choli is a support garment meant to take place place of a bra, it takes a bit of fitting but is simple and quick to construct. See here for complete choli fitting instructions. Jewelry is also fairly simple but there is lots of it. The minimum jewelry “kit” consists of 2-3 necklaces, bangle bracelets, disk earrings, anklets or ankle bells, and tikka. 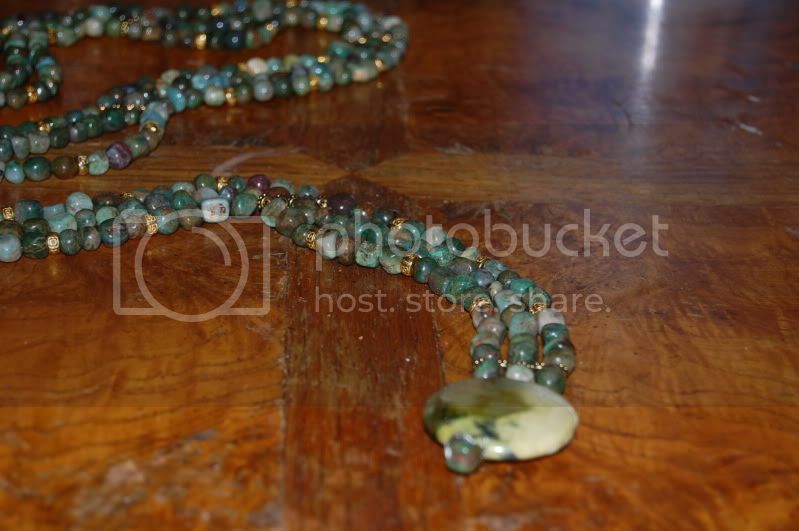 Necklaces- can be beaded necklaces such as pearls, glass beads, gold beads, or any of those things mixed. Indian necklaces such as these are also appropriate (please note- nothing here is actually Banjara). Rigid gold torque-like necklaces called hansali are shown on most of the women in the manuscript, similar to this or this. Necklaces pictured in the manuscript are short, either chokers or no longer than just below the collarbones, but heavy. Bracelets- simple rigid narrow bangle bracelets, and lots of them, not wide “tribal” cuffs. Gold-colored is preferable but any color is acceptable. Wearing several inches of bracelets on each arm is normal, at least 12 thin bangles. “Polki” bangles have faux jewels but can be very simple and appropriate for extra bling, like these. Disk earrings- almost all of the earrings in the manuscript show the women wearing large disk earrings with hollow centers. My theory is that these ear disks are modeled after the stretch piercing ear jewelry fashionable in many areas for centuries, or they may be actual stretch piercing jewelry, only clumsily portrayed. These earrings can be easily faked by purchasing any disk-shaped earrings, removing the hooks, and attaching posts about 1/4 of the way from the edge, so it covers the antitragus of the ear. Anklets or ankle bells- silver flexible chains with bells, either woven metal or cast metal, are appropriate. A great way to make comfortable payal is to buy the brass bells by the bag and crochet them into chains. The leather cuffs with rows of large bells are too loud to be worn by servers and are really only worn while dancing. 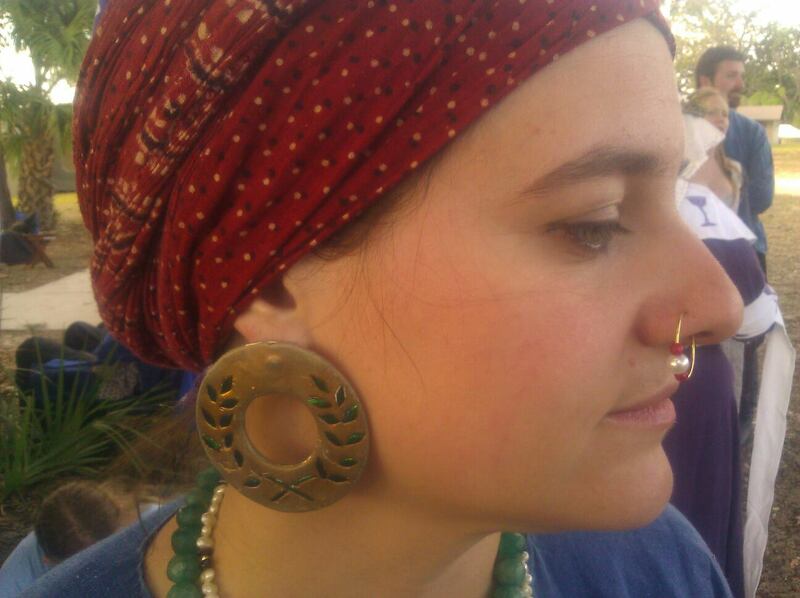 Tikka- these are forehead jewels that hang from the center part of your hair. Sometimes tikka also have side-pieces that lay along the hairline to the right and left of the center jewel to the ears. Modern tikka tend to suffer from an overload of dangly bits and little bells. Try to find simple designs in gold-colored metal. To keep the tikka in place, do not use hair pins. Tie the tikka chain, just at the hairline, to the center of a long thread the color of your hair. Tie the thread at the back of your head under your hair. This will keep the tikka chain in place without pulling your hair. Extra hair ornaments- many of the paintings show women in buns with lots of small gold ornaments in their hair. The paintings are too small to see shape or ornamentation, but something like this or this look like a similar style. Hair flowers- adding flowers to your hair are a cheap way to add a lot of beauty. Wrapping strings of flowers around a bun or adding falls of flowers to the top of a braid, or weaving flowers into the braid are all ways to add flowers to your hair. 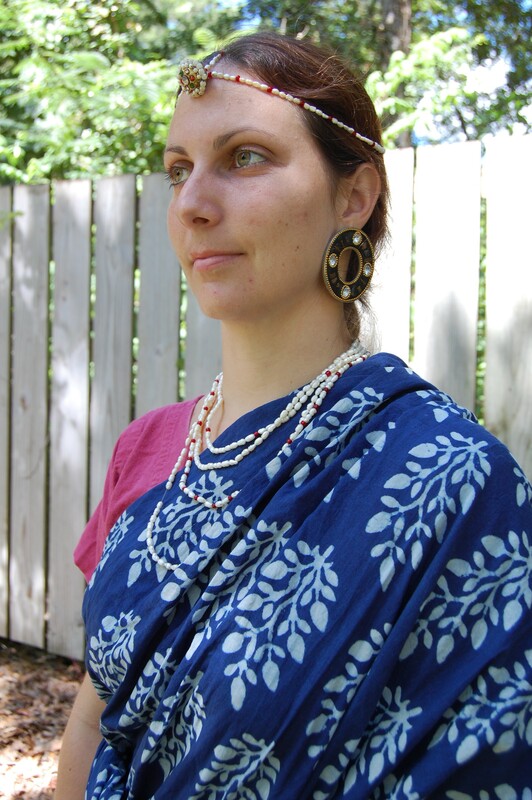 Belts- cloth or woven associate belts can be worn over the sari. This is “SCA etiquette” and I don’t think it looks too out of place. Beaded belts are also appropriate, just make sure you don’t make your beaded belt a “claimed” color. Stick on bindi make baby Krishna cry. They are as aggressively modern as stretch velvet cholis. What about salwar kameez sets? Salwar kameez sets are completely modern, evolved from Persian underwear, and very simple unadorned salwar kameez sets can be used as a ready-made underwear layer for period Persian or Turkish garb. I am interested in serving feast, I will try and find the necessary jewels that is needed. Will there be someone who might be able to braid waist long hair, I am left handed and have trouble doing this.